PowerPoint slideshows provide rich visual medium to showcase and explain about any topic. However, with lot of style elements, images, video embeds – final size of PowerPoint slideshow presentation file can be very big. 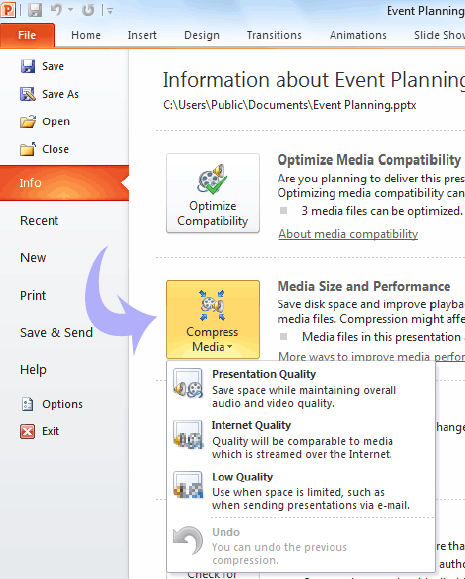 Microsoft PowerPoint 2010 has ‘Compress Media’ feature for reducing size of PowerPoint 2010 file in few simple clicks. 1. Launch PowerPoint 2010 program and open Slideshow presentation which should be compressed for less file size. 2. Goto File > Info and then click ‘Compress Media’ button. Presentation quality Save space but maintain overall audio, video quality. Internet quality Quality will be comparable to media streamed on internet. Low quality Use when space limited, like when sending file via email. If the compressed PowerPoint slideshow quality is too low for your liking you can always undo compress media action. Alternatively, select other quality option for compressing slideshow file. It should be noted that Compress Media is only available if you have video and/or audio in the PowerPoint show. If you have images then look at “Reduce the file size of a picture” in the help. Also worth trying a piece of 3rd party software called NXPowerLite that is made specifically for this task.